Brian was raised in the small town of Liverpool, Nova Scotia, on Canada's east coast; he has lived and worked in Germany for over twenty years. He was born into a musical family: his mother was a music teacher and organist, his father was an enthusiastic amateur choral singer. After humble beginnings, joining the the band at the local paper mill at age twelve, he has become one of the most sought after specialists on historical flutes in the current early music scene in Germany. After completing his Bachelor of Music in Flute Performance at the University of Victoria, Canada and a Master's and Doctor of Musical Arts in Performance Practice at Stanford University in California, he studied baroque flute with Wilbert Hazelzet at the Royal Conservatory in The Hague, Netherlands, completing the "Certificaat Oude Muziek". Brian appears throughout Europe and on numerous radio and CD recordings with such notable ensembles as The Amsterdam Baroque Orchestra, Barockorchester Stuttgart, Concerto Köln and the FestspielOrchesterGöttingen (FOG) of the International Handel Festival Göttingen founded by Nicolas McGegan and now led by Laurence Cummings. 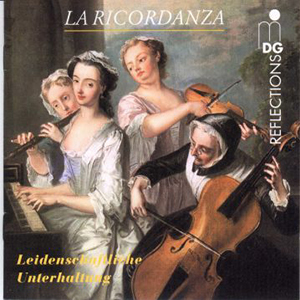 With his ensemble La Ricordanza, of whom he is a founding member, he has recorded 5 critically acclaimed CDs. 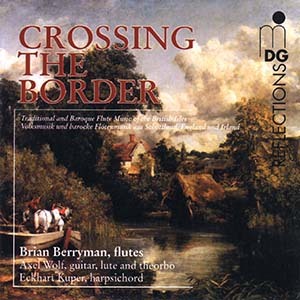 His solo recording, "Crossing the Border", and the concert programme of the same name, are a must-see for aficionados of stylistically adventurous and creative flute playing. 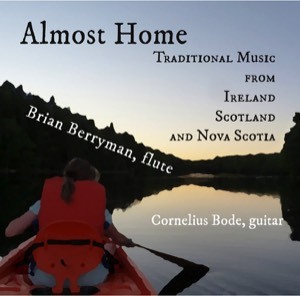 His latest solo CD, "Almost Home", explores his Nova Scotian roots: Together with guitarist Cornelius Bode he presents a programme of traditional Irish and Scottish music, as well as music from Cape Breton on Canada's east coast. Since 2006 he is principal flute of the period-instrument orchestra The Hannoversche Hofkapelle and can be heard as soloist regularly in their annual (and sold out!) New Year's Eve concert. Brian has been a faculty member of the music school in Salzgitter, Germany for over ten years, teaching flute and conducting the youth orchestra, with whom he has won numerous prizes. A. Vivaldi, Concerto in re per flauto bei der "Venezianischer Nacht"
What happens when a classically trained flutist from Nova Scotia, living in Germany, gets homesick? This CD is an attempt to answer that question. If you have ever arrived in a place for the first time and yet felt instantly at home, you will understand something of what playing traditional music means to me: Growing up in Nova Scotia means you're never far away from the sounds of Celtic music; after some years in Germany I decided to realize a long-held dream and began playing Irish flute. It became instantly clear to me that this was no mere hobby, nor was it just a sideline to the orchestral playing which forms the backbone of my career. After almost two decades of sessions and concerts I am only still dipping into the well; I have reconciled myself to having classical accents in my playing, just as I will never sound completely German despite years of trying! No matter: This traditional music welcomes those who approach it with admiration and respect, rewarding the player and listener alike. Traditional music players speak of their tunes as objects, heirlooms to be treasured and passed on as gifts. Not: "Where did you learn that? ", but rather: "Who gave that one to you?". "I got this from my father" is a common reply. So when I'm playing a traditional tune, it is all mine for the moment, in that moment when I breathe life into it. Later I will pass it on to another player and it becomes his or hers, and so on. I like to hope that the Beethoven symphonies and Bach cantatas I play have gained something of this relationship; if music isn't personal why bother? And so even though I came from elsewhere I still have a strong sense of belonging; I'll never be a native, but neither am I a casual visitor. I feel welcomed; it is a great privilege and good fortune to be "almost home". "Learned, Fiery and Sublime": Thus was Quantz's flute playing described in his obituary. Johann Joachim Quantz (1697-1773) : In a period of constant wars and skirmishes between smaller ducal states he espoused an ideal of a multinational musical style. In an age where musicians were classed as labourers and servants he enjoyed a status and salary most of his colleagues could only dream of. Best known as the flute teacher of Frederick the Great, his musical development was essentially in place by the time he was awarded the official position at the Prussian court in 1740 (when he was in his early forties). Quantz's formative experiences were made in Dresden and during his three-year "Bildungsreise" through Italy, France, England and the Netherlands in the eyrs 1724 to 1727. This recording explores some of the sources of Quantz's internationalized style, grouping two representative works by Quantz together with works by composers who he met on his Grand Tour. 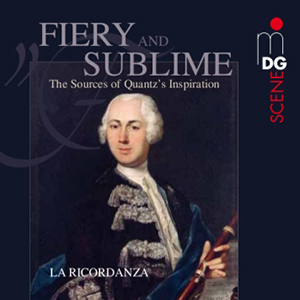 The fiery and furious Italian style was often portrayed as the diametrically opposite pole to the sentimental and pleasing French style; Quantz saw German musicians in a uniquely advantageous position, being able to draw the best from both worlds to form their own mixed taste. In Quantz's own closing words to his 1752 treatise (my translation): "...For a musical style, which is not merely accepted by just one state, or one province, or by this or that nation alone, but rather is appreciated by many different peoples; a music that can only be perceived as good, must, when based on sound principles of reason and of healthy sensibilities, be, indisputably, the very best." Available for purchase directly via PayPal, 18€ including shipping and PayPal fees. If you order a CD please send me an e-mail with your address and order details. To a musician in Europe during the eighteenth century, London must have seemed like a city of limitless opportunities. 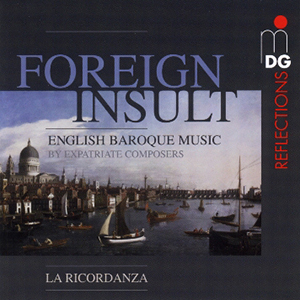 The pieces on this recording span almost a century, from 1685-1774, and give witness to the powerful attraction of London on the continental composers of the baroque period..
For the French, Italian and German musicians who flocked to the British capital there were many and varied opportunities to be had as a freelance musician. The straitjacket of court employment in Germany or Italy, despite the regular paycheque, was for many composers less attractive than the precarious life of a freelancer in London. In the duchies of Germany and Italy, musical tastes and activities were subject to the whims of more or less enlightened rulers. In contrast, London's musical life was subject to the laws of supply and demand. The paying public, hungry for entertainment, welcomed enterprising and talented musicians whatever their origins, thereby nourishing a musical landscape that for over 100 years was the most varied and dynamic in Europe. Available for direct purchase via PayPal. Please send me an email message with your address and order details. The styles of baroque and traditional folk music often seem to be worlds apart, played by musicians who rarely cross the border into the other genre. Historically just the opposite situation was more common; the border between the two realms of baroque and folk music was a site of heavy traffic: Far from disdaining each other's style, violinist and fiddler often expressed mutual esteem for the other's music. Baroque composers made frequent use of folk melodies for their compositions; folk musicians in turn were influenced by the music of their colleagues at court.Â This CD selects some of the many baroque pieces which are variations on traditional melodies, interspersed with Irish and Scottish dance tunes from 18th-century sources or commonly heard in pub sessions today. Keiser's friend and supporter Johann Mattheson, a renowned theoretician and composer resident in Hamburg, never tired of singing his praises in print. 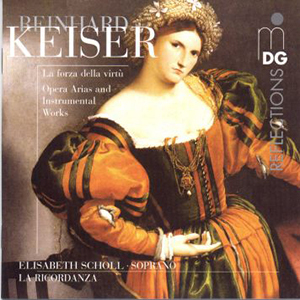 Keiser's music is, for him, above all "galant, loving", and conveys "all the passions to which the human heart is most prone." Available for direct purchase via PayPal. Please send me an e-mail with your address and order details. "...a well written concerto...resembles a passionate conversation between the soloist and the orchestra accompanying him; the soloist communicates his feelings to the ensemble; the ensemble applauds him with briefly inserted imitation, soon it confirms his expression; in the Allegro it tries to stoke the fire of his enthusiasm even further..."
The German lexicographer Heinrich Christoph Koch's definition of the concerto in his Musikalisches Lexikon of 1802 fits equally well to the four earlier incarnations of the high baroque concerto for wind soloist and orchestra on this recording. 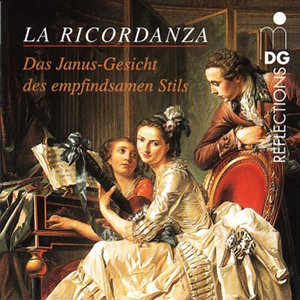 In the second half of the eighteenth century music was Janus-faced: Like the ancient Roman god of doorways, beginnings and endings, music was focussed simultaneously on its baroque past and classical future. In attempting to depict stronger passions in music than was hitherdo deemed acceptable in public, composers strained the formal boundaries of music to their breaking point. Composers like Carl Philipp Emanuel Bach and Johann Gottlob Janitsch experimented with unresolved dissonances and speechlike phrasing, in an effort to expand the possibilities of musical expression within prevailing convention. At the same time there was a reaction against this highly emotionalised style, represented above all by composers who were still beholden to aristocratic patronage, as was the case with Johann Christian Bach, the "London" Bach. His courtly listeners rejected emotional excesses as much as they rejected the overly learned counterpoint of the high baroque, in favour of a more pleasant and refined musical style. Clips from Brian's YouTube channel. This set of "Old Scots Tunes" is also available on the "Foreign Insult" CD. The video is a live concert recording from Schloss Salder, Germany. From the Irish Pub in Göttingen at our concert "Händel Goes Pub": Three Breton An Dros, also popular in the Irish folk scene! Another set from our Göttingen Irish Pub concert, a mix of a slow American folk lament, a slow Irish reel and some fast Cape Breton fiddle music! The beautiful Andante from Bach's flute sonata in E minor, recorded live at Schloss Salder, Germany.